The bank will help countries meet the Paris Agreement but its energy strategy still leaves the door open to coal, reports chinadialogue’s Liu Qin. The Asian Infrastructure Investment Bank (AIIB), headquartered in Beijing, held its second annual meeting on the Korean island of Jeju last week. Korea is currently positioning Jeju as a zero-carbon tourist destination so the choice of location must have seemed appropriate for a bank that is looking to promote a “clean” image. But the real test will be how the bank acts on its Energy Sector Strategy, which was revealed at the meeting. Energy projects require large investments, operate for decades, and can have significant and long-lasting impacts on regional carbon emissions. This means that decisions over which energy projects get funded have important implications for the bank’s environmental performance and that of host countries. 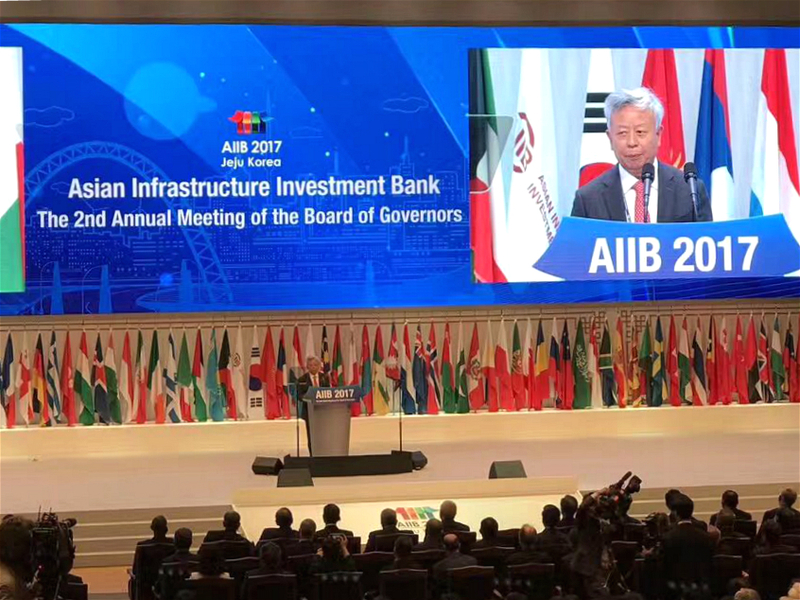 Echoing Xi Jinping’s firm support for the Paris Agreement, AIIB chief Jin Liqun, speaking at the opening of the bank’s annual meeting on June 16, made clear that the AIIB has an important role to play in helping countries fulfil the Paris Agreement. He singled out an electricity grid project in Bangladesh as an example of the AIIB helping 12 million rural residents to access cheap electricity, all while avoiding 16,000 tonnes of CO2 emissions. This means that prior to making investments, the AIIB will consider the potential impacts on carbon emissions, and whether proposed projects will help the host nations achieve their climate change targets. This includes, for example, lowering regional carbon intensity and increasing the proportion of renewables in the energy mix. So far we haven’t invested in coal power, nor do we have any current plans to do so. If there are any concerns over environmental impact, we will not invest in such projects. Oxfam spokesperson Mei Jiayong told chinadialogue that the AIIB has committed to promote both the Paris Agreement and the UN’s sustainable development goals, which is a good start. The AIIB can provide member nations with the funding to achieve renewable energy goals and continue the trend of southern nations emerging as climate leaders. But the new energy sector strategy has not laid to rest concerns by NGOs because the language on investments in coal power under certain circumstances was retained in the final document. Concern over the environmental and health consequences of expanding coal power in Asia is growing, and so the AIIB’s stance on the sector has been closely watched. Bai Yunwen, a researcher with Greenovation Hub, told chinadialogue that there had been no change in the language on coal power between the second and final drafts, and carbon efficient coal and natural gas projects could be funded in three circumstances: the replacement of less efficient capacity; when essential for reliability and integrity of the system; and when there is no viable or affordable alternative. Bai Yunwen pointed out that overall the AIIB wants to avoid funding coal but has left itself scope to do so in future. And so there is a “lack of clear definitions and policy guidance,” for decision-making on coal power projects. Wang Wawa of Bankwatch said that given the AIIB’s energy strategy and existing investments, it is unclear how it will help members reach their Paris Agreement goals. She said there is a gap between the AIIB’s energy strategy and the approach of other multilateral banks on coal power. “Other international financial bodies have withdrawn from coal power. The Asian Development Bank hasn’t funded a single coal power project since 2013; the European Investment Bank no longer has anything to do with coal power and has put strict emissions efficiency standards in place. Last year the president of the World Bank described coal power in Southeast Asia as ‘a disaster for the planet’, yet the AIIB still says ‘carbon efficient oil- and coal-fired power plants would be considered’”. Mei Jiayong pointed out that the coal industry is already at work lobbying the AIIB. With three new projects given the go-ahead at the annual meeting, the AIIB has officially approved 16 investments – none of which involve coal power. The seven energy-sector investments made to date include hydropower, natural gas, and gas and power networks. Alongside being “clean and green” the AIIB claims to be “lean”. But this claim is also being put to the test. According to a Caixin report, one of the biggest differences between the AIIB and other development banks such as the Asian Development Bank and the World Bank is the lack of a resident board of directors. This is expected to save the AIIB approximately US$70 million a year. But some NGOs are worried the bank’s efforts to be “lean” may lead to “sloppiness” in the way investments are managed. Bai Yunwen points out that in the energy strategy the bank only refers to low-carbon transitions in general; there are no roadmaps to achieve targets or staged goals, no quantified aims for the various forms of energy, or when the document will come in to effect. Other multilateral banks, such as the World Bank and the Asian Development Bank, have more specific policies that add substance to their overarching strategies. WWF China has suggested relative or absolute targets are set, such as for total annual investment, or annual rate of growth of investment. For example, in renewables it suggests the AIIB invest at least US$5 billion a year in wind and solar power, or to have renewables account for at least 50 per cent of new electricity capacity funded by the bank. Again, unlike the more established multilateral banks, the AIIB’s projects are mostly jointly-funded with other banks. Jin Liqun indicated the AIIB doesn’t see other banks as competitors, but as partners. But Kate Geary of the Bank Information Centre says this may lead the bank to pass responsibility for the management of projects and the social and environmental outcomes onto its partners. Geary pointed out that some bank members have already raised concerns in private that the bank is being too hasty, with the board of directors asked to approve high-risk projects such as the India Infrastructure Fund and the Myingyang Power Plant in Myanmar before the appropriate policies and systems are in place. Investment in the India Infrastructure Fund was approved at the recent annual meeting, but Geary warns working through financial agencies in this way may lead to the bank losing control of the environmental footprint of its projects. Meanwhile two key safeguarding measures, the bank’s complaints handling mechanism and public information policy are still being finalised. The AIIB has existed for less than 18 months and will continue developing its systems. But the controversy surrounding what it invests in looks likely to continue, too. The AIIB has promised not to compromise on the environment, meaning every energy project it takes on will be closely watched.